I love you and miss you so much…. this sturdy breed for some time. Tolt…pace…beauty…long thick manes, confident minds and beautiful souls. In short: Icelandic horses. This was the breed the young girl wanted. So the day had arrived! One of the most famous Icelandic horse studs – an exciting place to be anyway – and two horses to choose from. 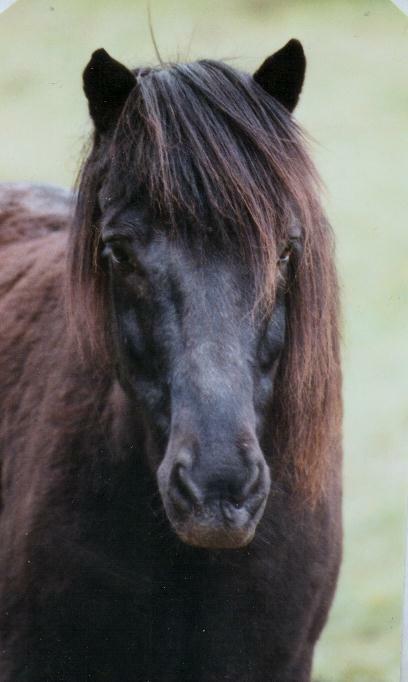 A young chestnut with thick, blonde mane and a jet black gelding with red highlights in his mane, which, despite sweet itch, was thick and beautiful. The girl got to ride both of the horses…both had an excellent pedigree, showed great tolt under saddle – but it was the black gelding that had that special look in this eyes. 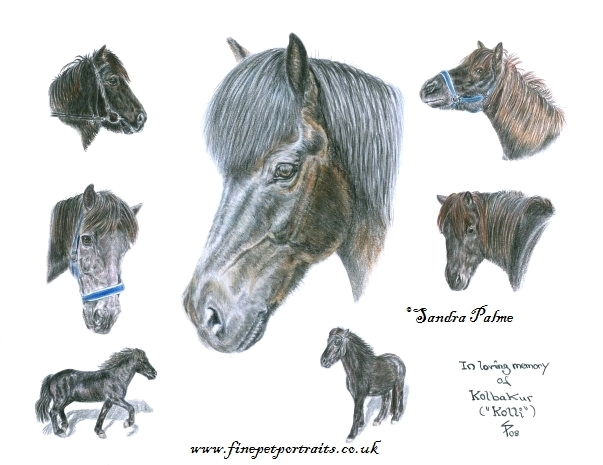 This was you – a black, confident Icelandic treasure called ‘Kolbakur’, which is Icelandic for ‘(horse with a) black back’. ‘Kolbakur von Aegidienberg, -‘Kolli’ to his friends – you were going home with the girl. You were 9 years old at the time, bred in Germany and born on 15 June 1979. Your pedigree was outstanding, inlcuding names such as Glófaxi frá Sandhólaferju, Vörður frá Kýrholti or Goði frá Sauðárkróki. This isn’t what made you special, though, Kolli. The girl was me. And what made you special was that you were my friend for almost 17 years. be a horse. You lived out in the fields all year round with your many four-legged Icelandic friends. As you received treatment for your sweet itch, you were usually able to enjoy your summers too. liked you to at times but you would never have bucked or anything trying to get rid of me. I have so many wonderful memories of hours spent together in sunshine, rain or snow…hacking, going for walks (looking for your favourite plants) or just me watching you play with your friends. You loved your food and were always keen to find out what I had brought you…carrots, apples or dried bread…. You taught the young stallions manners. Can you remember how they respected and adored you? You were also adopted, looked after and loved to bits by Faxi, a handsome chestnut Aegidienberg stallion. He was always around you, protecting you. The two of you became good friends and were never seen apart although it has to be said that it was Faxi who was crazy about you and you basically didn’t mind being looked after. However, if I took you out, groomed you, went riding or for walks with you it was Faxi going nuts running up and down the field, neighing – not you. You knew all about priorities. You were certainly one very smart horse, Kolli! So many memories, so many things we went through together – I suppose I could write a book about our time together. Kolli my little bear, you became a part of my life that I almost took for granted. You were just there – I never imagined that I’d lose you. you crossed the rainbow bridge. Kolli, I still miss you so much. I hope you are happy where you are now, running free with other horses…young again and with access to as much food as you’d like. Please don’t forget me…I hope you know how much I love you and will be waiting for me at the rainbow bridge. Until then you’ll be in my heart and thoughts always. Kolli, I thank you for almost 17 years of friendship…and I know that the bond we had will never be broken. I love you, Kolli.